Hedge-fund manager Alcaly views with a sanguine eye the state of the American economy. 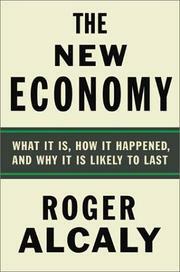 It is, he avers, “in the early stages of a new epoch of superior productivity growth and prosperity.” Though such Panglossian pronouncements may raise a few eyebrows, Alcaly does present a reasoned and reasonable history of the recent American economy and argues forcefully, if not always persuasively, that such new technologies as telecommunications and computers will be the straws that stir our freshened economic drinks. This serves multiple purposes: to explain fundamental economic concepts like productivity and the Federal Reserve; to examine such historical analogues as the invention of the transistor and the economic effects of electrifying America; to analyze recent successes (Dell) and failures (Apple); to provide perspective on a variety of notorious players of recent years (Michael Milken appear sans devil’s horns); to praise former and current Fed chairmen Paul Volcker and Alan Greenspan; and to bury John Kenneth Galbraith, whose 1967 classic, The New Industrial State, Alcahy calls “dreadfully wrong” and whom the author appears to be accusing of intellectual dishonesty. Companies like Wal-Mart, Dell, Nucor, and Toyota owe much of their impressive success to their organizational flexibility and facility with new technologies, Alcaly argues. He also states that the collapse of the techno-stock bubble should have surprised no one, that the corporate shenanigans of Enron, WorldCom, et al. are unremarkable in bubble periods, and that junk bonds and corporate raiding were, on balance, good things for the 1980s economy. In his paean to Volcker and Greenspan (is there room on Mt. Rushmore? ), the author declares that they have kept the economy bubbling away quite nicely, thank you. He is less adept at suggesting ways to hobble the avaricious or de-gild the golden parachutes. Learned and readable, but not everyone will be convinced.